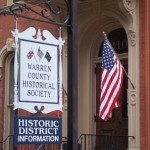 It is the mission of the Warren County Historical Society to provide educational programming through the use of local historical artifacts, images, documents and textiles. This programming will promote interest in the county’s heritage. To this purpose the organization will preserve, interpret and exhibit the material culture of all generations in Warren County, Pennsylvania since the beginning. The educational resources of the organization will be made available to all individuals, businesses, municipalities and organizations. This mission will be achieved through the preservation by acquisition and care of Warren County related artifacts, images, documents and textiles, to include a genealogical collection and a local history oriented library that will be available to members and the general public. This mission also requires involvement with the community organizations and individuals in order to support and communicate the importance of historic preservation and the historical integrity of Warren County, Pennsylvania. This mission is held in the highest regard by the Warren County Historical Society’s board of directors, staff and volunteers. Current Projects/Needs: The Warren County Historical Society sponsors an annual summer internship program. The program is designed to provide additional manpower for projects that require special attention. The Wilder Museum is a holding of the historical society and requires funding for exhibits and preservation efforts. The museum displays over 3,000 artifacts depicting Warren County history.